Materials: It cuts vitrified materials and hard porcelain materials. Diameter: 12"/300mm. Continuous Rim. Materials: Ceramics and Porcelain It cuts vitrified materials and hard porcelain materials. Diameter: 12"/300mm. 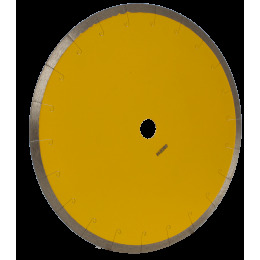 Continuous Rim, Soft cutting and no chipping. Central flange to allow angle cuts.. Application: FIt cuts vitrified materials and hard porcelain materials.